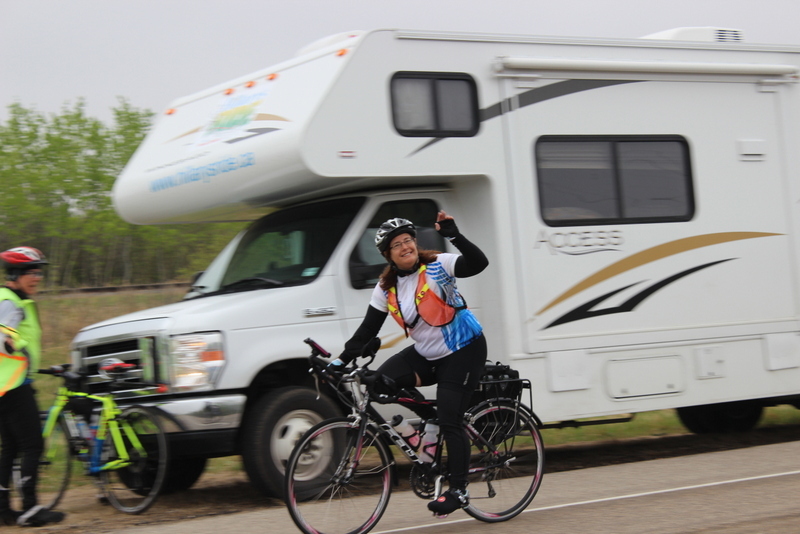 <- Read the previous update: When Life Gives you Lemons…..
Today, we did a revised ride, to make up some kilometers, after heading to Yorkton a day early. We all got a chance to ride another great western Canadian highway, the Yellowhead. We drove out east to almost the Manitoba border (within about 50 metres – no cheating by crossing over before we properly completed Saskatchewan). The weather was looking tentative to start, it was totally overcast and the clouds were kind of gray. But we ended up having an absolutely fantastic ride, I am thrilled to report. 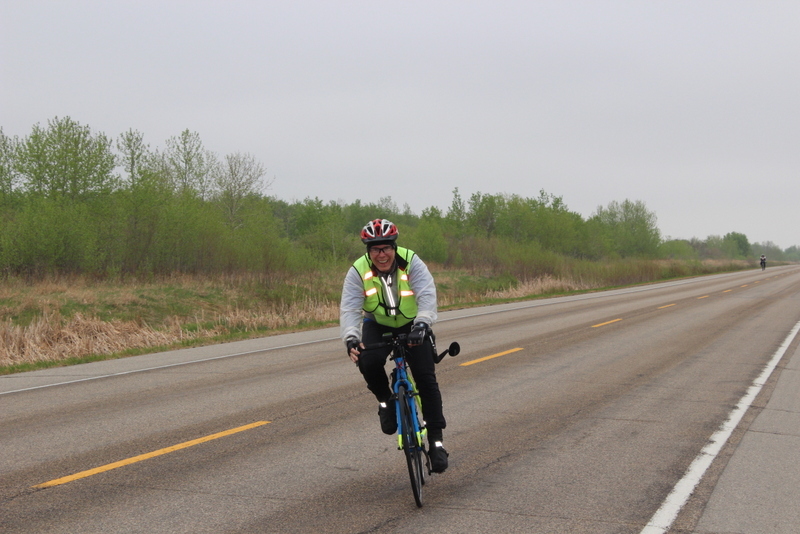 We had a mild tailwind, and there was absolutely no rain, just a little mist. This was the prairies I had remembered. Long, straight highway, no hills to speak of, peaceful and quiet. In between the rail tracks and the highway, which run parallel to each other, were lots of reeds, ponds and marshland. The birds were incredible, chirping and chattering, swooping and gliding. Traffic was really light, so we could hear them serenade us all morning. I think everyone should find time alone out in nature, where you can get fresh air and clear your mind. No to do lists, no meetings, no pressing issues – just spin, spin, spin. And on a day like this, your legs really go on autopilot. For me, it was actually a melancholy day, but in the sweetest, simplest way. I am finding this is one of the great gifts of this ride – to just be. We’ve passed through many small towns, there is one about every 10 miles, settled during the time the railway was being built. Each has their own personality and claim to fame. Churchbridge, for instance, is home of Ruth, who created the winning design for the Canada 125th year loonie. In Langenburg, they were setting up for a hotdog fundraiser and swimming registration. We made a deal that we would donate $10,000 to them, if they donated it to us right back. No one had a cheque, so Al ended up buying a “future” hotdog (they weren’t ready yet). 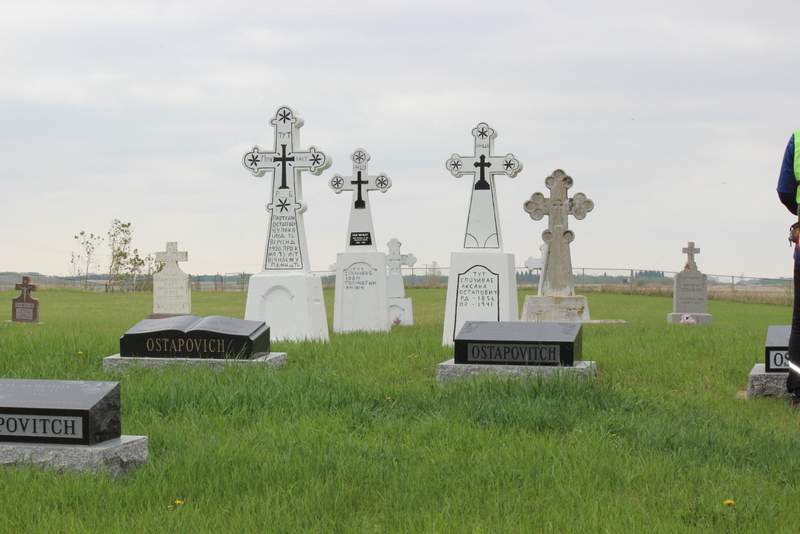 We also visited a serene little cemetery just outside Insinger, with gravestones going back to 1907. It was sad how many were for children, it reminds me how far we really have come with healthcare – thanks Tommy Douglas. We managed to do over 130 kms, and were still done by 4:00ish for the drive back to Yorkton, feeling pretty refreshed. Amazing the time you can make when the elements are on your side. Staying at Ethel’s has been pretty special for me. All my grandparents had either passed away, or lived outside the country when I was born, so I never really had the grandma experience. I’m pretty certain I’m getting it now. I’m sleeping in the childhood room of Vicki, Terry’s wife, and imagining what it was like being a teen in Yorkton then. And Ethel is amazing. She is 91 (and a half – don’t forget the half! ), still lives at home on her own, and is sharp as a tack. 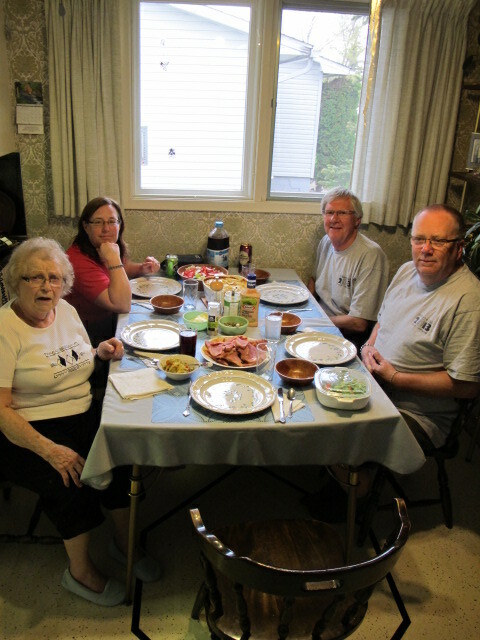 She is sending us on our way with homemade jams, and she made a delicious dinner tonight of ham and scalloped potatoes, and homemade banana cream pie. Another great home-cooked meal! Did I mention we also had bacon and eggs for breakfast? We are really getting the royal treatment! I also want to acknowledge the generous offer we received from the White Bear First Nations. They invited us to stay at the Bear Claw Hotel and Casino on our day off for rest and recuperation. 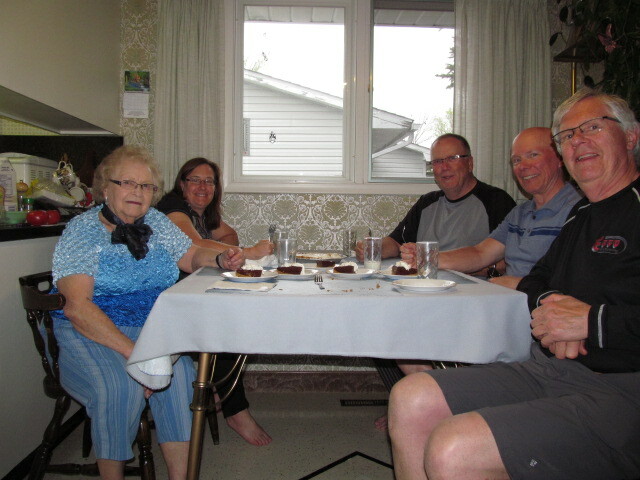 Since we were already staying in Yorkton, we had to decline, but we really appreciated their kindness. Thank you Brennan! We’re all looking forward to tomorrow’s rest day – we won’t have another one until Thunderbay, so we need to stock up on energy for all of Manitoba! We had a lovely, sleepy day off. Lots of laundry, and each of the cyclists went for a massage again, which was delightful. The spa we went to is normally closed on Sunday’s, but when the massage therapist heard what the cause was for (her great uncle recently died of suicide), she gave up her day off to take care of us. Thanks C! While I was sleeping in, Al and Terry cleaned the motorhome from top to bottom! What a treat to have a clean start tomorrow. Terry is making a stew tonight, so we have some more ready-made meals on our long days. You get to know people a lot better once you live with them in a 31 foot RV, and I’ve definitely learned that Terry likes to be on the go, and has the energy to do it! If he’s not cooking pancakes, he’s doing laundry or getting groceries. I want to start calling him “the Flash”, but that could have too many alternate meanings, so I’ll keep searching for a nickname for him. After another yummy dinner, we cleaned our bikes, and started preparing for our next stretch on the bike. Plans will depend on the weather. Stay tuned. Well done you guys but,no more fancy detours , I’m getting a headache trying to figure out what you are doing. Keep up the HARD work.God’s speed! Mike Davis. We follow your trek every day – my words can’t describe what I feel (good/nostalgic/happy) as I read your prairie ride – small towns & great people everywhere. Our prayers are for you all to ride safely to your destination and I know you are bringing peace to people with your journey. Hi Folks! I’ve been watching the blog for some time now and just wanted to comment how amazing I think this whole thing is. So great to see so many communities being touched by this unique, grass roots awareness spreading endeavour. Every time I see a new picture, I get a bit misty eyed thinking about the courage and heart involved in this project. As a suicide survivor myself, I just wanted to share that I think this is a truly beautiful way to honor your daughter/sister/loved one. I can only imagine that she would be so proud of all of your efforts and I hope you feel her with you, encouraging you along every step of your journey. Your team truly inspires me, and from this blog it looks like you are inspiring many others also. Hello everyone. Your journey is inspiring in so many ways: the physical part of it (Canada is SO darn big! This would be an easier trip if we lived in Liechtenstein…); and the mental part of it (getting up every single day to do more miles, deal with the weather, keep clean, do laundry, organize the next event … wow, I get tired just writing that.). My hat is off to all of you. Sue, I loved your description of the importance of finding time to be alone in nature. Doing that has helped me so many times in the past. I wish more people could experience it and learn how restorative nature (and exercise) can be. I think another thing your trip is driving home, and what I’ve found in most of my travels, is that the kindness of strangers abounds everywhere. Too often we read about human misdeeds and cruelty. But, really, most people are kind by default and a journey such as yours illustrates that so much, doesn’t it? Keep on keepin’ on. Your efforts ARE making a difference – probably in ways you’ll never really fully know.